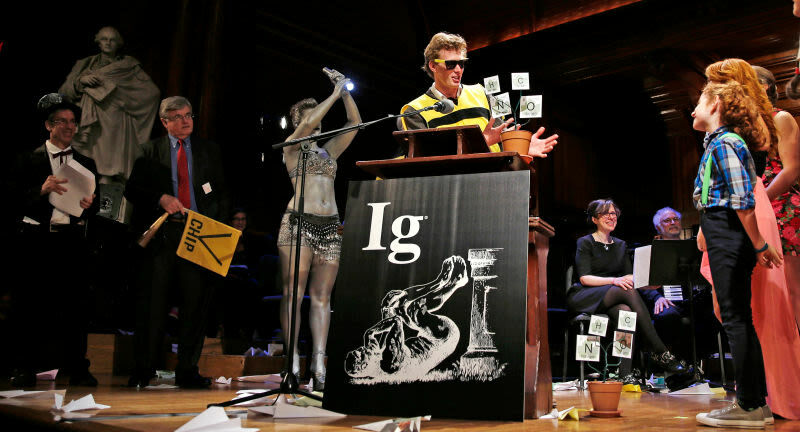 Created in 1991, the Ig Nobel prize was created in opposition to the more famous Nobel Prize. The Ig Nobel, however, is designed to celebrate the overlooked and underappreciated aspects of research and discovery. Or in their own words: celebrate discoveries “that cannot, or should not, be reproduced”. To celebrate this (ahem) noble pursuit and celebration of the most trivial and pointless of research, I will highlight the best 5 prize winners the Ig Nobel has awarded in its 26 year life-span. 1. In 1995 David B Busch and James R Starling of Madison, Wisconsin were awarded the Ig Nobel of Literature for their research report “Rectal Foreign Bodies: Case Reports and a Comprehensive Review of the World’s Literature”. The report included all manner of objects that had “somehow” got inserted into a person’s “rear end”, including seven light bulbs and a frozen pig’s tail. 2. The first person to collect their award in person was Don Featherstone in 1996, who won an Ig Nobel Prize in Art for his “ornamentally evolutionary invention” of the plastic pink flamingo. A truly revolutionary piece of art that has graced landfills for over 20 years. 3. George and Charlotte Blonsky were presented with the Ig Nobel for Managed Health Care in 1999 for the invention of a device to aid childbirth: the subject is strapped to a circular table, which is then rotated at high speed. Because childbirth wasn’t messy, confusing, or chaotic enough. 4. The Ig Nobel Technology Prize of 2001 was presented to both John Keogh of Victoria of Australia for patenting the wheel, and to the Australian Patent Office for granting him Innovation Patent #2001100012. Because why reinvent the wheel when you can just patent it? 5. The mayor of Vilnius, Lithuania Arturas Zukoas was awarded the 2011 Peace prize for solving the problem of illegally parked luxury cars. He ran over them with a tank. The Ig Nobel Prize, supporting Direct Action since 2011. The Ig Nobel is bizarre, but it sheds light on scientific discoveries and pieces of research that may have been forgotten by time. And we are definitely in a better world knowing that in 1995, researchers at Keio University trained pigeons to discriminate between the paintings of Picasso and those of Monet.